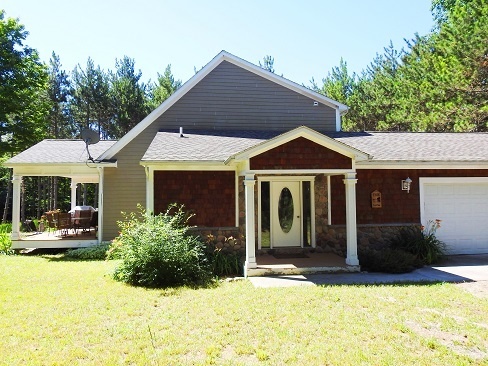 This newer home, near the north end of Torch Lake, is nestled in two acres of red pines. Close to the access to Torch Lake and Lake Michigan, restaurants, shopping, skiing, sledding and snowmobiling. Torch Time offers something for every season. Torch Time provides you with all the modern conveniences to accommodate 12 guests. The open-space floor plan makes gathering and entertaining easy. Enjoy eating meals on the large covered deck overlooking the pines, and settle in around the fire pit to roast s’mores. Bring your boat and you will appreciate easy access to the north end of Torch Lake, one of the most beautiful lakes in the world! The Caribbean colored water is spectacular with much to see along the 20 miles of lake. Or bring your snow mobiles to venture all along the trails. Take a short drive to Bellaire and stop by Short’s Brewery. Skiing is another great option at Schuss Mountain, Shanty Creek and Boyne Mountain. Torch Time is great for families: have fun with ping pong, darts, board games, toys and outdoor activities. While sitting on the deck you will probably see some of the local wildlife, or walk the property and follow the animal prints. The area is surrounded by cherry and apple orchards, great for walking and biking. Northern Michigan has so much to offer. Enjoy the local area wineries, world class golf, local festivals, spectacular fall colors and so much more!